Jaime Dickinson, the guiding force at NewCom, was recently honored as the World Teleport Associations 2010 Teleport Executive of the Year for his global vision and commitment to fostering education and development through 21st century communications. As president and COO, Jaime oversees all operations and drives the companys strategic partnership efforts  working to expand NewComs presence around the globe. Under his direction, NewCom has emerged as a leading force in the global telecommunications marketplace to be recognized as the second fastest growing teleport operator in the world. Jaime got his start in the telecom sector in the early 1990s as a founding partner of Vannamei, a satellite equipment distribution company. While at Vannamei, he was instrumental in launching sister companies, Publicom and Networldtron, which offered installation and Internet services and gave Vannamei customers a one-stop communications solution. In the late 1990s, Jaime, together with his family, sold the companies to American Tower and joined the telecom giants newly formed Verestar. In 2004, Jaime returned to his entrepreneurial roots by launching NewCom International. Mr. Dickinson, what initially prompted you to enter the SATCOM business? It stems back to the demand we were receiving from the Latin American market 18 years ago. At the time, I was in the export business  exporting products to Latin America. We started to experience demand for satellite equipment and we recognized an underdeveloped situation that needed to be optimized so we became resellers. From there, our customers began requesting telecom services, so we stepped in to fill that need as well. Ultimately, it was the huge demand for SATCOM services that triggered our entry into this market segment. Would you please tell us about your background and how such helps you with your current endeavors? I come from Latin America but have an American father who gave us the opportunity to live and go to school in the U.S. Because of my Latin American heritage, I understand the culture, the language and the needs. We knew there was a demand for U.S. resources, so we created an outlet to help people and corporations buy resources from the U.S. by becoming purchase agents for them. That, in turn, opened a lot of doors in Latin America and gave us access to many opportunities to sell the satellite equipment we represented. In addition to the contacts we had and knew in Latin America, becoming part of Verastar in the late 1990s helped us to grow our footprint to other regions such as Africa and the Middle East, and helped strengthen our name in the market. Your current company, NewCom International, has been involved in the African continent for a number of years. What opportunities did you see that prompted you to engage in this market segment? The African market is similar to Latin America in that its an underdeveloped continent that has a lot of needs. With all of our experience in Latin America, we were prepared to come into the African market and duplicate some of our programs and successes. We also feel that we have an advantage in Africa as we have already experienced the challenges of having fiber coming into a market and understand the cycle. 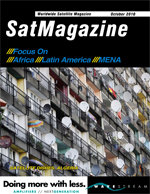 In your opinion, how has SATCOM influenced the average African citizen? They now have a gateway to communicate with the outside world. Thanks to the competition and the abundance of satellite communications resources and better technology, prices have dropped substantially. This makes it easy and affordable for them to remain in touch with friends and loved ones around the globe as well as to access the latest global information through the Internet. What are the biggest market opportunities for SATCOM providers in Africa? Government and GSM operators. GSM operators represent one of the fastest growing business opportunities for SATCOM providers because they are aggressively growing their wireless networks and must also grow their footprint throughout an entire region  not just in cities  and that requires satellite communications. Government projects are also a big growth area because, as we have seen in Latin America, it has become extremely important to governments in Africa to provide their citizens with access to education by bringing 21st century communications to rural areas throughout their countries. What are the biggest challenges to market entry? In Africa, the biggest challenge is the stability of the country. In countries such as the Congo and Sierra Leone, there is a great deal of political turmoil. This makes it a big risk to invest in satellite communications technology. While the budget might be there for the project today, its not certain that it will be there tomorrow. To help minimize the risk, we always team up with local partners who are willing to share the burden with us. But we still sometimes have to say no to the opportunity if we feel the risk is too great. What do you see as the differentiators between satellite and fiber connectivity? The biggest differences are reach and dependability. With satellite, you can cover a full territory at multiple connection points and its fast. You just point the antenna to the target satellite, and youre connected. With fiber, in many cases, you are limited to point-to-point connections in the larger population centers. Usually its too expensive to bring fiber to remote areas of the country. Its also extremely costly and time-consuming to build a fiber network, and reliability can be an issue as well. Accidents happen. Do you see the abundance of undersea fiber connectivity coming to the African continent  and the lower costs associated with fiber  as a threat to the SATCOM marketplace? It definitely affects it. We saw it happen in Latin America, when our large customers didnt come back and renew their satellite solutions. But what it also did is open our eyes to all the niche market opportunities. We started shifting some of our resources to markets where fiber didnt reach, such as the rural market sector. We also started investigating satellite-dependent applications, such as video distribution and multi-cast. We believe the pattern will repeat itself in Africa and our experience in Latin America has us prepared to serve these enormous niche markets and access their opportunities. What is currently driving the demand for capacity in Africa? How do you predict this will evolve over the next few years? In a word: Globalization. There are a lot of multinationals coming in from all over Europe to tap into the vast natural resources, such as cement, asphalt, oil and gas. They are setting up operations in Africa and these companies need to be connected to their headquarters. The multinational employees are also used to accessing communications and video and are hungry for better service. There is also a demand from the local people who see they need to be better connected with the world to expand their business operations. How is the cellular market affecting the SATCOM industry in Africa? I think there are probably a few solutions where cellular is the way to connect rather than satellite. I think the impact is minimal and I believe the positive far outweighs the negative as celluar providers all need international backhaul, and satellite is, in many cases, the key for growth. All in all, I view cellular providers as strategic partners for us because they are doing the local market work to develop the customer base. As they accomplish that, there is a growing demand for more capacity  which is where satellite comes in. Where do you see the majority of capacity being used in Africa now and over the next few years? The Northwest Africa region, in places like Nigeria, all of the West Africa regions and in central regions such as the Congo. Its all being driven by companies that are tapping into the vast natural resources in these regions. What are the major markets, in your estimation, as far as regional appetite for SATCOM? Northwest and Central Africa. We also see demand in the Middle East and Southeast Asia. Do you feel the African military environment is going to start to absorb much of todays available capacity? We havent seen much of that. Maybe they should become a big player for capacity so they gain better control of national security, but thats not what weve experienced so far. Where we are noting governments using capacity is in the social arena  bringing communications to rural communities. With the FIFA WORLD CUP having enjoyed such global prominence, do you expect to see communication companies expressing greater interest in serving the African markets? The way I see it, the World Cup focused on South Africa and I think it mainly helped the tourist business there and has attracted people who want to invest in South African real estate. As far as helping with expansion throughout the continent, I dont see that as much. I think overall interest in the African continent is being driven by local resources, such as mining and oil. What has been NewComs key to success in the Africa market? Being persistent and providing quality service at a good price. For us, it has always been about servicing our clients in the best way possible and providing excellent quality. Many of the vendors outside Africa dont like dealing with Africa  sometimes they send opportunities to us to take over because they are afraid of the risk. However, we travel to Africa often and we know our clients and have been able to build the confidence and trust necessary on both sides to make these projects a true success.